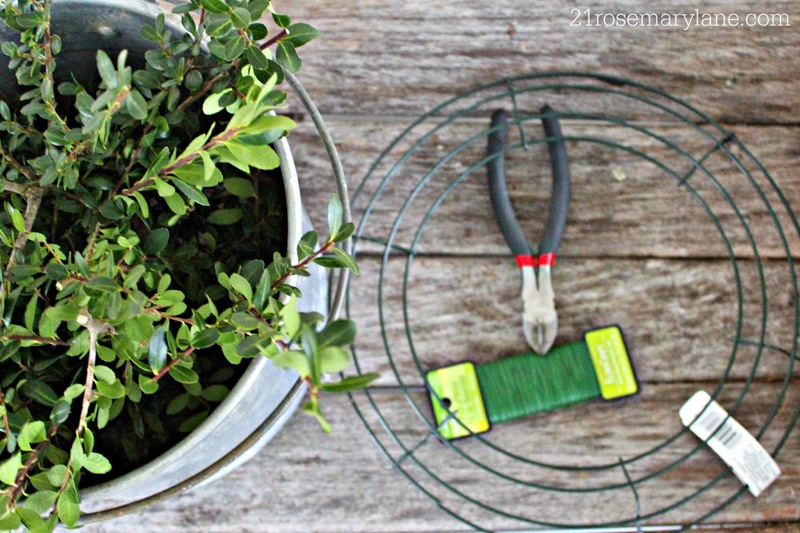 I have always loved the look of boxwood wreaths and since we have a rather Large BOXWOOD in our backyard I decided it was time to take the plunge and create one. 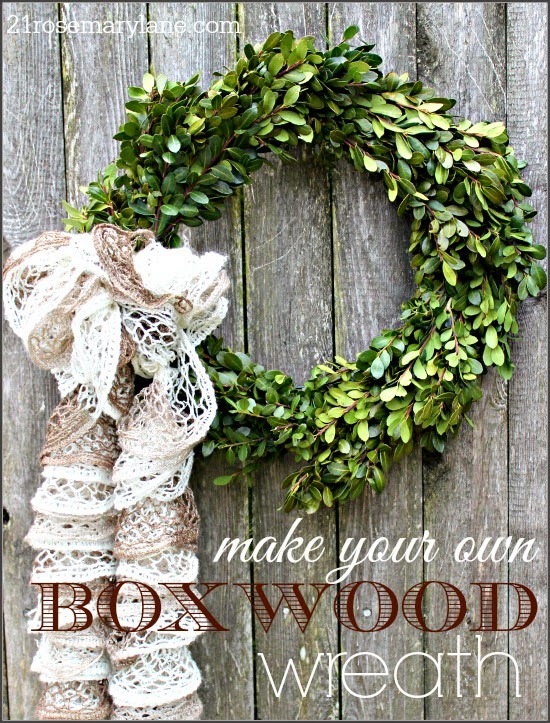 So I Googled "boxwood wreaths" and came across Martha Stewart's tutorial on just how to make a pretty wreath for myself. The materials you need are fairly simple. Next take about 6-9 sprigs and wire them together with some floral wire to create a bundle. Repeat and make as many bundles as possible. I want to say that my 12 inch wire frame needed roughly 40 bundles. Once you have made all of your bundles, take one end of the wire and anchor it to the wire wreath by simply tying a knot. 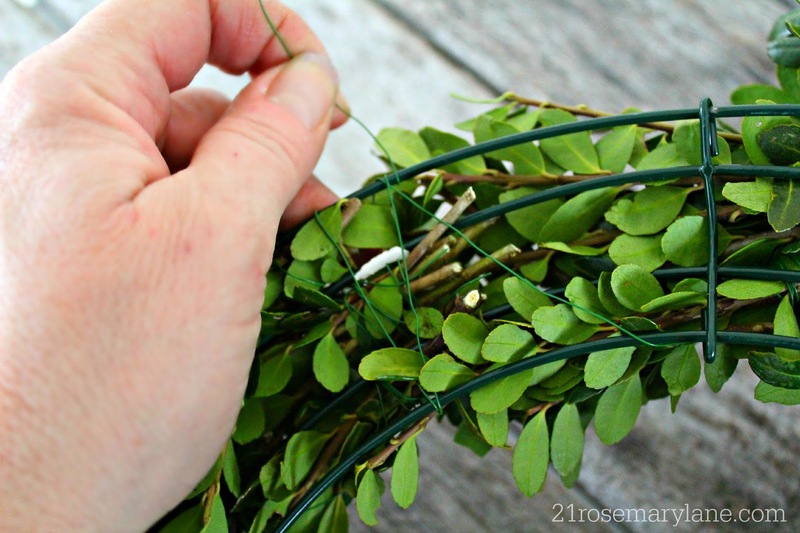 Then take two bundles at a time and begin to wire them onto your wreath frame by wrapping the wire on in a continuous motion. Make sure you wrap the bundles on at their bases, where you wired the bundles together. When you are done check your wreath to make sure it is evenly full. If you missed any spots just fill in with another bundle or two. Then trim the wreath as needed. I didn't want my wreath to look too contrived so I used a lovely tubular scarf my cousin Carol of Carol's Creative Creations had made for me last year for Christmas as the bow. 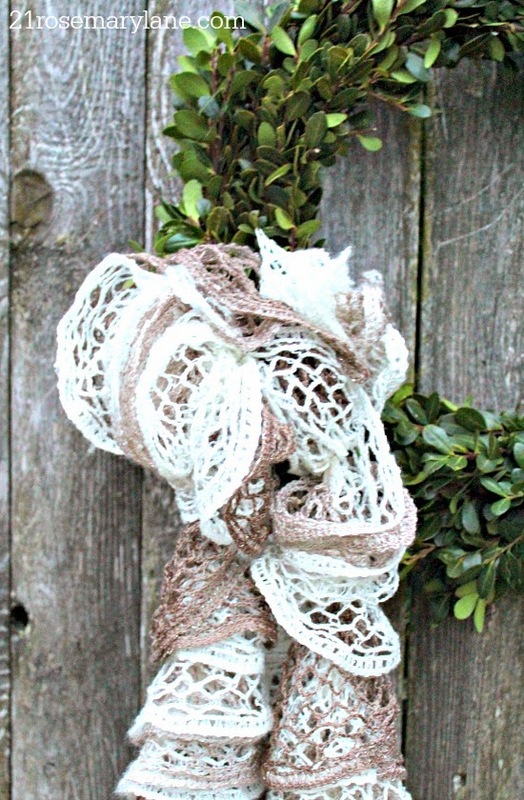 I think the yarn gives it a nice textural contrast. Are you close to being ready for Christmas? I still a boat load of package wrapping to do so that is what will be on my agenda for tomorrow. Oh wow, this is gorgeous and such a great tutorial too. Thanks for sharing your DIY wreath with all of us. 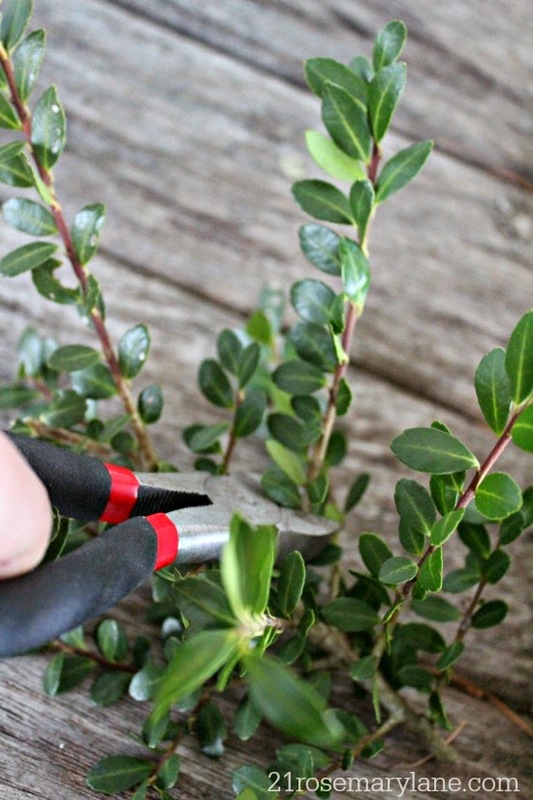 I have some small bushes, so maybe I should make myself one. 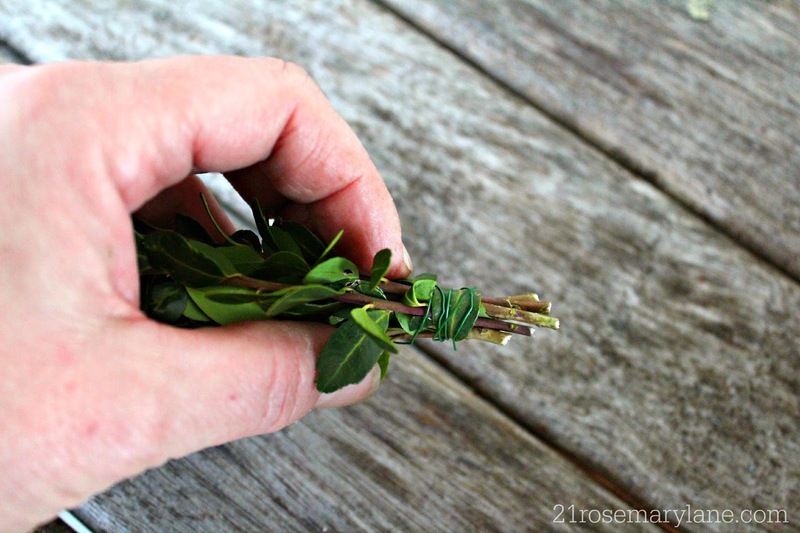 I bet we see some boxwood in your gift wrapping :) I am sharing some gift wrapping ideas tomorrow. I love making boxwood wreaths every year. Last year I thought I had "scaped" my boxwoods and they would never recover! They bring a sense of freshness to our homes. Very pretty! So pretty! I'm going to make one this weekend. Thanks for sharing. 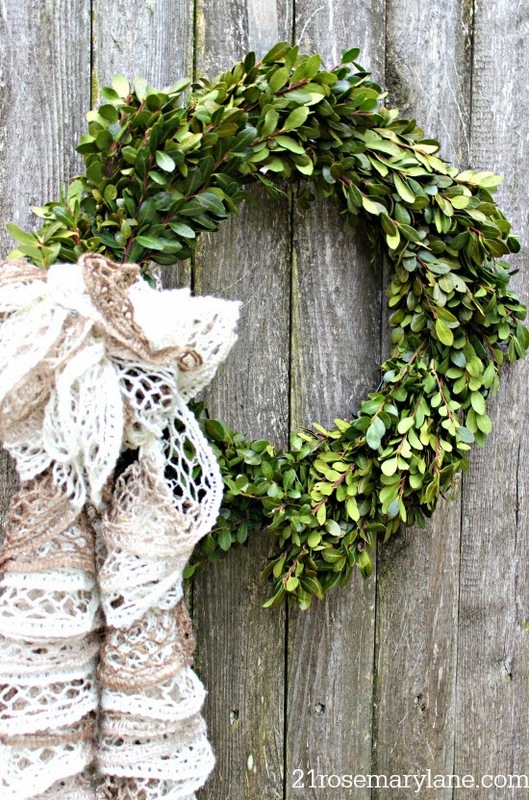 I love boxwood wreaths and this one is especially pretty!